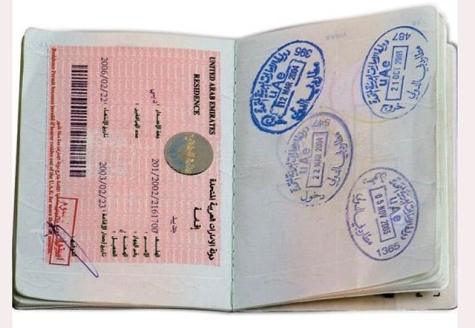 Married couples can sponsor each other for a residence visa in Dubai, Abu Dhabi, Sharjah, and the rest of the UAE. Note that the sponsorship is only for a residence visa which is not the same as an employment visa / work permit / labour card. If the spouse is working, then s/he is supposed to get a work permit from the employer. It is not uncommon for spouses to work (usually part-time) without a labour card but be aware that s/he will not have any rights should there be a dispute between the employee and the employer, and there is potential for problems (fines, labour ban, deportation) if found out. There are some restrictions when applying to sponsor your wife or husband. Husband can sponsor their wife whether she is employed or not, and no matter what his occupation is (except in Sharjah which have funny restrictions on which occupations are permitted to sponsor their families). The sponsor must have a salary of at least AED 4,000 per month, or AED 3,000 if the company provides accommodation. This may have increased to AED 5,000 or 6,000 per month without accommodation and AED 4,000 with accommodation in 2009 (check with the immigration department). There was a proposal by the Federal National Council (FNC) in December 2008 that the minimum salary should be increased to AED 8,000 and AED 10,000 per month. Update: according to press reports 01 July 2009, this change to minimum AED 10,000 per month will be implemented (unknown when), but possible exceptions for humanitarian cases could be made (ask at immigration department). People in de-facto relationships cannot sponsor their partners - a marriage certificate is required. It probably wouldn't be advisable to even try since it is illegal for those who are living together without marriage. Muslim expatriates with more than one wife can only sponsor one of them for a residence visa (Gulf News 28 October 2007). Wives under the age of 25 might need special permission from the Director General of the immigration department (not confirmed). There may be some flexibility in how these rules are applied, depending on which emirate you're in, what nationality you are or what country your passport comes from, how much you earn, your profession, the time of day, and how much special handling money you have. Women who don't fit the criteria above could apply at the relevant immigration department for special dispensation to sponsor their husbands. Alternatively, trade up to a newer model husband who already has a job and a sponsor. Our Consultancy firm was established in 2015 by a team of Professionals with more than 10 years of experience in the UAE market. We distinguish ourselves from other Consultancy companies through our unique range of services. We offer comprehensive packages of services about sponsor in dubai that usually only a dedicated business Partner can provide you. The Forex market officially opens in Australia, then moves into the Asian session, followed by the European session and finally ending in the Americas, before repeating the cycle again. This means that there can be many more difference between stocks and futures in the Forex market (since it is open longer), and also less of a gap risk than the stock market. This allows Forex traders to have a more accurate sense of risk management for their trades than many stock traders. Optical Internet (COI) is primarily for medium- to large-sized businesses, and government and educational entities who need a high-Tucson Tax Preparation Services dedicated connection to the Internet. Three key factors, namely, aging population, expensive medical innovation, and defensive care, contribute substantially to the fastest rate of health care growth in our history, reaching $2 trillion in 2005. On one hand, the participants of every ancillary industry to health care have increased their profits in step with the rising costs. On the other hand, the medical and chiropractic office owners - the actual health care providers - have not only failed to keep up with raising costs but have lost a Outsourced Chronic Care Management part of their income. How such a paradoxical situation is possible without a deliberate and systematic strategy against health care providers? Thanks for sharing such a good blog. I appreciate your thought and views. Best Home Packers and Movers is one the best Packers and Movers Viman Nagar and all over India. Florida Link Insurance Rate Hikes - Can I avoid them? Why do they occur? Find out more information on why your health insurance premiums go up every year in Florida.